CHANGWON, Jan. 21 (Korea Bizwire) — Stars from the South Korean Basketball League (KBL) made a rare public appearance at this year’s All-Stars Game to meet with their fans. Basketball stars from across the country gathered at Changwon Gymnasium in Changwon, South Gyeongsang Province to participate in the 2018-2019 SKT 5GX KBL All-Star Game on Sunday. The players mingled with their fans at photo zones, coffee shops and pizza vendors set up in front of the stadium. Fans bustled in and out of the stadium as they tried to take photos with Jeonju KCC Egis guard Chon Tae-poong, Busan KT Sonicboom guard Heo Hoon and other popular stars. Changwon LG Sakers center Kim Jong-kyu and guard Kim Si-rae, first-time All-Stars, were also present and distributed finger food to their fans. Center Ra Gun-ah from Ulsan Hyundai Mobis Phoebus, the ‘backbone’ of the South Korea men’s national basketball team, was also busy greeting fans. “I go to KT’s home stadium all the time to cheer for the team, and I am so excited to meet them in person,” said Yun Dae-hyuk, a KT fan. 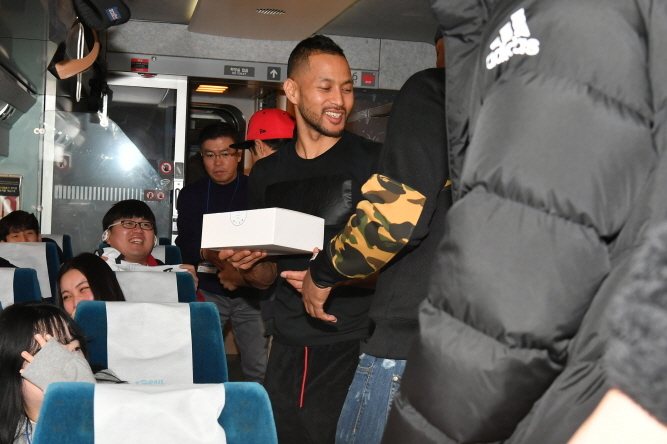 The basketball players, who travelled from Seoul by train, engaged with their fans who were onboard the same train. 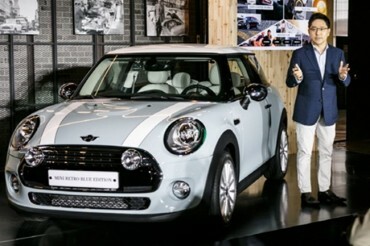 In Changwon, they held a ‘mini Olympics’ to play games with their fans, and the best five from each team participated in a pre-opening event on the eve of the basketball championship.